Itaquerao stadium could be closed during the World Cup if problems aren't fixed, according to a statement from state prosecutors. Safety problems at the stadium hosting the World Cup opener in Brazil were being ignored so work could finish in time for the tournament, a top labor official said in an interview published on Thursday. One of the main labor ministry officials in Sao Paulo told the Folha de S. Paulo newspaper that inspectors were "looking the other way" so the already-delayed stadium would be completed before the June 12 opener. 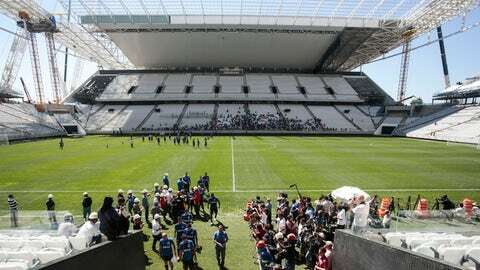 Also on Thursday, Sao Paulo state prosecutors released a statement pointing to irregularities at the Itaquerao stadium, saying it could close the venue "even during the World Cup" if problems weren’t fixed. Labor officials halted the installation of 20,000 temporary seats on Monday, saying new safety measures had to be added following the death of a 23-year-old worker on Saturday.